David Moyes suffered his first home defeat since he took charge of Real Sociedad as his side were beaten by Rayo Vallecano in La Liga. Former Everton and Manchester United boss Moyes, on the touchline for the last time before a two-game ban, has now failed to win his last four games. Sociedad striker Imanol Agirretxe twice had shots saved by Vallecano goalkeeper Tono before Esteban Granero shot wide. But the visitors won it when ex-United striker Manucho headed in a corner. The Angola international, who was at Old Trafford for the 2008-09 season but only made three substitute appearances for the Red Devils before a loan spell at Hull, met Roberto Trashorras's 81st-minute set-piece to score the only goal. Sociedad have not won since a 1-0 victory against Barcelona on 4 January and are 12th in the table, only three points above the relegation zone. Moyes took charge in November in his first job since being sacked by United in April but has only won three of 12 matches at Sociedad. The Scot will have to watch their next two games - against Eibar at home on 24 January and away at European champions Real Madrid on 1 February - away from the touchline after his dismissal during his side's Copa del Rey game against Villarreal on Wednesday. He remonstrated with officials over an offside decision and was sent off, before he climbed over a pitch-side fence to sit with his side's supporters. Match ends, Real Sociedad 0, Rayo Vallecano 1. Second Half ends, Real Sociedad 0, Rayo Vallecano 1. Offside, Rayo Vallecano. Álex Moreno tries a through ball, but Manucho is caught offside. Corner, Real Sociedad. Conceded by Quini. Offside, Rayo Vallecano. Toño tries a through ball, but Álex Moreno is caught offside. Offside, Real Sociedad. Xabi Prieto tries a through ball, but Carlos Vela is caught offside. Attempt blocked. Sergio Canales (Real Sociedad) left footed shot from a difficult angle and long range on the right is blocked. Foul by Jozabed (Rayo Vallecano). Xabi Prieto (Real Sociedad) wins a free kick on the right wing. Alfred Finnbogason (Real Sociedad) wins a free kick in the attacking half. Attempt missed. Iñigo Martínez (Real Sociedad) left footed shot from outside the box is too high. Assisted by Rubén Pardo. Foul by Raúl Baena (Rayo Vallecano). Imanol Agirretxe (Real Sociedad) wins a free kick in the attacking half. Attempt saved. Raúl Baena (Rayo Vallecano) right footed shot from outside the box is saved in the centre of the goal. Assisted by Roberto Trashorras. Substitution, Real Sociedad. Alfred Finnbogason replaces Esteban Granero. Attempt missed. Ion Ansotegi (Real Sociedad) header from the centre of the box is close, but misses to the left. Assisted by Gonzalo Castro with a cross following a corner. Goal! Real Sociedad 0, Rayo Vallecano 1. Manucho (Rayo Vallecano) header from the centre of the box to the bottom left corner. Assisted by Roberto Trashorras with a cross following a corner. Corner, Rayo Vallecano. Conceded by Alberto De la Bella. Corner, Real Sociedad. Conceded by Emiliano Insúa. Jozabed (Rayo Vallecano) wins a free kick in the defensive half. Foul by Esteban Granero (Real Sociedad). Substitution, Real Sociedad. Gonzalo Castro replaces Aritz Elustondo. Substitution, Rayo Vallecano. Jozabed replaces Alberto Bueno. Quini (Rayo Vallecano) is shown the yellow card for a bad foul. Foul by Quini (Rayo Vallecano). Attempt saved. Álex Moreno (Rayo Vallecano) left footed shot from the left side of the box is saved in the bottom left corner. Assisted by Alberto Bueno. Corner, Rayo Vallecano. Conceded by Esteban Granero. Corner, Real Sociedad. Conceded by Zé Castro. Roberto Trashorras (Rayo Vallecano) is shown the yellow card for a bad foul. Carlos Vela (Real Sociedad) wins a free kick in the attacking half. Attempt missed. Imanol Agirretxe (Real Sociedad) right footed shot from the left side of the box is high and wide to the right. Assisted by Ion Ansotegi following a set piece situation. Foul by Emiliano Insúa (Rayo Vallecano). Attempt missed. Manucho (Rayo Vallecano) header from the centre of the box is too high. Assisted by Álex Moreno with a cross. 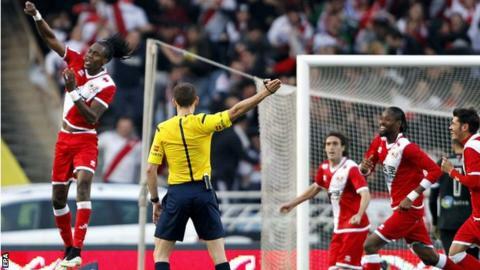 Manucho (Rayo Vallecano) is shown the yellow card for a bad foul.